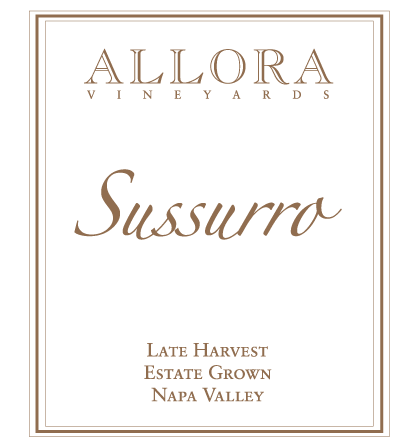 Only made when conditions are right, Sussurro is a late harvest, Port-Style wine. It is our first late harvest wine. All of the fruit was grown on our own Estate in St. Helena. A great vintage to hang a crop leads to a wonderful cinnamon raisin note. It is abundantly silky and smooth. The fortification does not overpower, but compliments perfectly. The Cabernet Sauvignon adds softness and fruit while the Petite Sirah adds smoke, char and spice. It is opulent and thoroughly enjoyable through every sip. Smooth, elegant and remarkably balanced, this late harvest wine is not overpowering or out of character. It is rich and flavorful while the finish keeps your attention. A long ideal growing season with warm days and cool to even cold nights yielding a balanced crop with intense colors and concentrated fruit flavors. Absolutely unique, truly one of a kind and a rare memory. The only time this wine will be made with Pinotage grapes. It is stunning, balanced and memorable.